About 16km south of Trivandrum, the capital of Kerala, Kovalam has been alluring the beachgoers since the 1930s. Flanked by coconut palm groves, the three crescent-shaped sandy and rocky beaches of Kovalam (Lighthouse Beach, Hawa Beach and Samudra Beach) are great places to, sunbathe, swim, snorkle and camp out. Of these, while Lighthouse and Hawa beaches are crowded, Samudra Beach is quiet and isolated. Kovalam is also a famous honeymoon destination in God’s Own Country, attracting many couples every year. Truly a favourite haunt for the newly weds, Kovalam offers unlimited array of attractions and activities to the honeymooners. 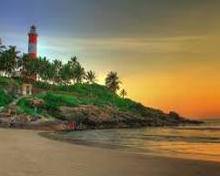 The Lighthouse beach is Kovalam’s main beach noted for its candy-striped red-and-white lighthouse. From the top of this 118-ft lighthouse one can have the stunning coastal views. The beach has lots of eating shacks lining its shire, where you can taste the delicious South Indian cuisine and some exotic seafood. Also known as Eve’s beach, Hawa Beach is also crowded like the Lighthouse beach and is located north of it. The Edakkal rocks which divide Lighthouse from Hawa beach offers an excellent viewpoint to watch the sunset. A visit to the Kovalam beach is something of an absolute must for the adventure lovers. Whether you’re into parasailing, Kite surfing, snorkeling, boating or fishing, you can enjoy all these at the beaches of Kovalam. 3 km from Kovalam is located the 8th century rock cut cave temple at Vizhinjam which is a quiet place where you can soak in spiritual energy. The temple is a protected monument under Archaeological Survey of India (ASI). Once a port town and capital of the Ay kingdom, Vizhinjam was coveted by the different dynasties intending to control it. By Air: Thiruvananthapuram, the capital of Kerala, India's most verdant state, is connected by flights from major cities in India and abroad. By Rail: Thiruvananthapuram is a major railhead connecting several important cities and places in India. By Road: Kovalam is connected by motorable road with Thiruvananthapuram which is connected by roads to all important places in South India. 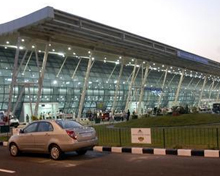 Some of the cities and places connected with Thiruvananthapuram by road are Kochi (220km), Thekkady (253 km), Wayanad (360 km), Trichy (469 km) and Chennai (708 km). Visitors choose the budget hotels located on the fringes of the beaches o Kovalam. Some of the resorts are away from hustle and bustle of Kovalam and provide tranquility and peace. Surya Samudra, Leela and Taj Green Cove Resort are top end resorts. There are many hotels in Kovalam that offers Ayurvedic treatments.